The tomato-nosed bagel deer. Seriously…nuff said. I love that guy and his chocolate chip eyes and pretzel antlers. 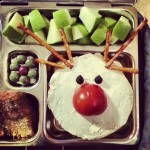 If you’d like to know more about the lunchboxes featured in these pictures and posts, then you should take a look at PlanetBox Lunchboxes.